We’re having a little lunch at work this week to sort-of-farewell my library volunteer who is taking some time off to manage some family issues for the next couple of months. She’s the loveliest person ever and always spoils me with home-cooked meals (which make me feel very guilty but not so guilty that I don’t go home and gobble them up, ha ha) and helps me out in the library and basically supports me more than she knows. I didn’t know what to bring and didn’t have a lot of ingredients in my pantry to make anything very exciting so I did a quick panicked look through my cookbooks to find something I could bake. 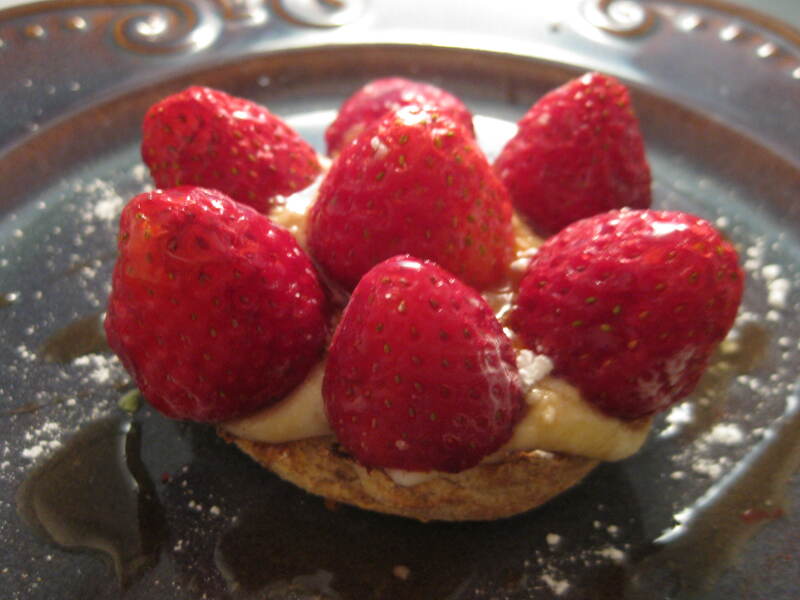 I had some strawberries in the fridge that were a bit past it but still fine to eat so I wanted to incorporate them. I ended up finding this recipe at Food.com and it worked a treat. I adapted it slightly, but it was so easy and the muffins are very tasty. I’m not actually a huge muffin fan, but I wolfed down a few of these – purely as a taste-testing exercise, you understand. They were delicious. And they’re a one-bowl wonder which is always good. No butter to beat or anything fiddly or fussy. A good standby recipe to have when you’ve got people coming over and have nothing to serve them. This recipe took less than 30 minutes – from making to baking and then eating. So quick! This would be a good recipe for kids (and first-time cooks) to have a go at. You could substitute any fruit in the recipe so give them a try with raspberries or blueberries, apple or even pineapple. Stir in sugar, oil and eggs and milk until mixed. I am seeing my friends this afternoon for another movie session. We get together, watch a movie or two (our current trend is Tarantino films but once they’re exhausted I’m sure we’ll move on…) and eat food that we’ve all prepared. We try to go with “healthy” snacks – doesn’t always happen but I think we all endeavour to bring/make things that are not too high in fat etc. I am suffering from a bad case of the “can’t-be-bothered”s this weekend. I am tired and grumpy and my body is whacking out on me (is that a term? it sounds rude) i.e. causing me pain (stupid hiatus hernia). I was going to try and make something complicated and impressive but instead went with a dessert that is neither. Just simple and easy. Anyway, try this if you’re looking for something quick to make and can’t be bothered with a lot of whipping/beating/mixing etc. It has a nice flavour and is light and goes wonderfully with a berry compote or some fresh fruit. Grease and line a round springform tin. Mix all ingredients together in a large bowl. Whisk until smooth. Bake for approximately 40 minutes. Flan should be set and slightly firm to touch. Let cool/chill in fridge – overnight is best or for several hours. 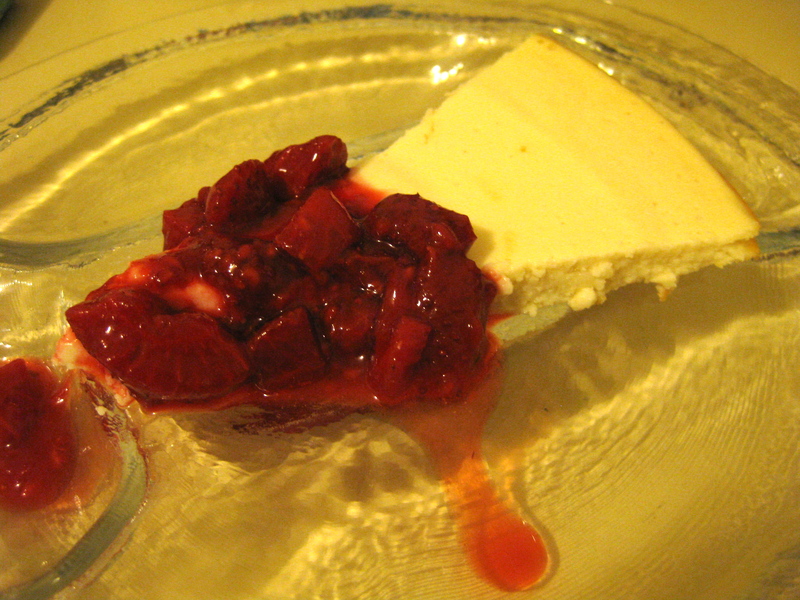 Serve with fresh fruit or berry compote. And that’s it! Pretty simple. The original recipe called for 500g quark cheese instead of the ricotta and yoghurt – so give that a go if you can find quark!